The Lansinoh Manual Breast Pump is a convenient, portable and discreet pump designed for occasional use at home or away. The unique ComfortSeal cushion creates a secure seal for more comfortable and efficient pumping. 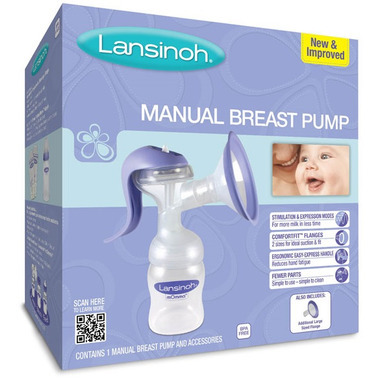 Lansinoh Manual Breast Pump's ergonomic handle and lightweight compact design allow for easy one-handed use. This pump is fairly comfortable to use. I was able to pump a lot of milk in a short amount of time. It is easy to assemble and clean. This breast pump is the best manual pump on the market. I've tried several brands and the Lansinoh is by far my favorite. It works amazing, cleaning it is so easy and it gets almost all the milk out every time. I recommend this pump to everyone I know who's expecting. I have a newborn and my own salon business. Life has been a balance trying to work and pump between clients! This pump is very effective! It is fast, quiet and easy to use. I throw a nursing cover in my bag a can pump anywhere! Love it better the my 200+ dollar electric one! I use it every day and find it very easy and comfortable. I can get a lot of milk (4oz or more) in the morning when I nurse on one side and pump on the other. I was planning to get an electric pump but so far (10 months) haven't needed to. The only thing I wish is that it was angled so that I could lean back while I was pumping instead of having to lean forward which isn't that comfortable. Great pump! I do not use this daily, only to express if I become to full ( when the baby has slept longer than expected) or if I will be away. It does exactly what I want. Good pump..does its job. But I've noticed after a couple months of using it, it's sounds squeaky when i push down the handle. Works well. Suction is not as high as amends, but more comfy. I had purchased this as a back up, but started using it after my electric pump (Ameda) died. That was 6 months ago and it worked so well, I decided that I didn't need to by another electric pump. Although, I only pump for times that I am away from baby. The suction is not quite as good as the electric, but I can usually pump enough milk for my needs. does the job perfectly and easily. reasonable price, too!